When I was in Paris back in 2005, some people, mainly female, would often comment how exciting it must be to be in Paris and go shopping. I couldn’t disagree more. Frankly, shopping is something I do because I need to. If I have no milk for my cereal, all my underwear has holes in it or I wind up at Wimbledon in the beating sun without a hat, I say to myself, “well, I guess I have to buy something.” I try and make shopping as quick and painless experience as possible. Get in, buy what you want, get out. No dilly-dallying or looking at other stuff. In Paris, I was doubly dissuaded from shopping, as the strength of the Canadian dollar against the Euro back in 2005 was, to be kind, poor. Everything in Paris was twice the price as back home. In my 7 weeks in Paris in 2005, other than food, drink and train tickets, I bought one pair jeans on sale for €15. 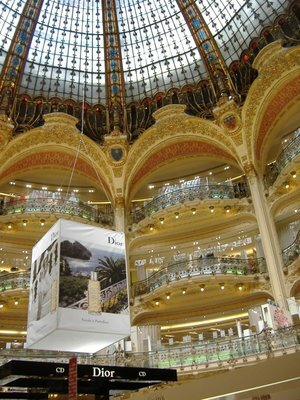 However, for many Paris is the shopping capital of the world. 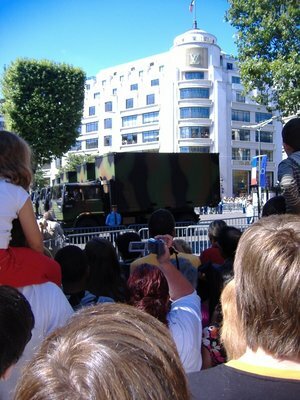 I was reminded of it while watching the Bastille Day parade, when 3 massive army trucks stopped on the Champs Elysee. Despite their power and might, they were overshadowed by a massive Yves St. Laurent sign on the building behind them. The might and majesty of the France military is nothing compared to the power of Paris’ fashion. While I may see shopping as just function, I understand that for many shopping is more than that. For some It is form, a see and be seen, get the right stuff and flaunt it. For others, it is sport, deal and bargain, shop and compare, search and find until the goal is achieved at the lowest price with the highest quality. For even others, it is therapy, a way to forget their troubles and feel good. For a select few, it is religion. For those few, Paris built Galleries Lafayette. 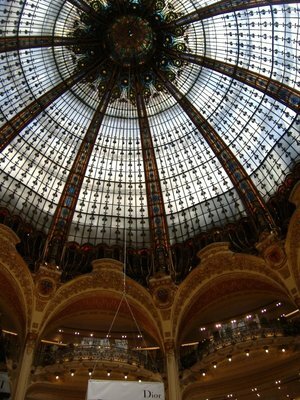 In three large buildings, just north of the Paris Opera is a massive shopping complex. On entering the largest of the buildings, one can’t help but gaze up and gasp in awe. You are in a massive dome with picturesque stained glass and detail work on the many balconies to rival the biggest religious houses in Europe. This is the Cathedral of shopping. I work my way up the floors of the main building. Floor 0 is perfume. Floor 1 is designer fashion. Floor 2 contemporary fashion, as well as the bridge to the men’s building. That’s right, this is just women’s fashion in the main building. Up to Floor 3. “Seductive fashion,” including lingerie. Floor 4 has an oxygen bar for those tired from the trudge up the elevator or breathless from the skimpy outfits from floor 3. As well, floor 4 has outdoor fashion. Floor 5 is children’s fashion. Finally floor 6, and my destination, one of the many restaurants in the Galleries Lafayette. 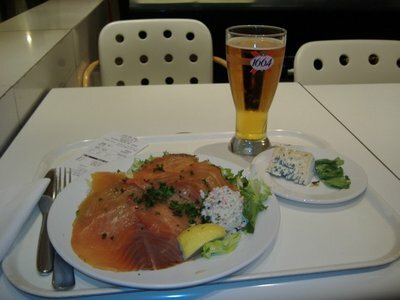 I buy lunch and beer for a wallet rocking €17. I decide to suffer it though. After all, when one is in a church, one is expected to tithe a little of their earnings to the power that is. In this case, the Gods of Shopping. Oooh, the food looks delicious! I am in agreement with you about the shopping though. Maybe I'd change my mind if I got to shop in an extraordinary setting like that one. Probably not. Thanks for highlighting the holiness of all Parisian activities - shopping! Galleries Lafayette truly is amazing, as is Printemps across the street. I've gotten lost in both of them.